We had wedding bells ring this month for one of our interns (it’s one of the pre-requisites to being on the team). We were so excited to hear about Julie’s wedding plans and when I found out how she and her fiancé (now husband) were working against the typical western wedding grain, I told her that they needed to share with you all. When I got engaged to a wonderful man last summer, we were really excited to get married, but we had no idea what a crazy whirlwind wedding planning is. We learned quickly that many decisions needed to be made…and no decision is a small one. Oh, and did I mention that every decision has financial repercussions? Wedding vendors give you a thousand ideas for things that will make your day perfect. But by wedding planning standards, we didn’t have a lot to spend on those “must-haves.” The average price of a wedding in 2012 was close to $27,000, which made the $8,000 we had budgeted for our wedding seem unrealistic. But we had to make it work. 1. Prioritize. What’s most important to you? Whatever it is, have your budget reflect that. If pictures are important to you, like they were to me, then hiring a good photographer will be worth every penny. But if you really want a great band, then put the money there. Really think through what you want, and then adjust your budget accordingly. 2. Be honest. We always told vendors that we had a limited budget, and many of them worked hard to make sure that we only spent what we had. Also, it’s perfectly reasonable to attempt negotiating cost, but do it respectfully. We tried to keep in mind that the money we were paying vendors is how they make their living, so we wanted to be fair with our negotiations. 3. Be willing to get a little cold. We had an off-season wedding on a Friday night, both of which helped to cut the cost significantly. 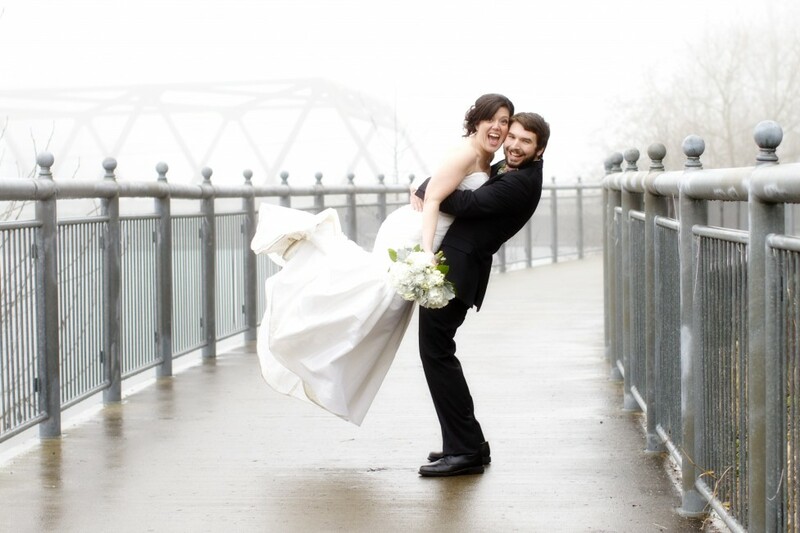 But a wedding in Seattle in January means that we took our wedding pictures outside on a day that had a high of 31 degrees! It was worth it to us, because having an off-season wedding allowed us to have our pick of (indoor) venues, as well as vendors, which also helped with price negotiation. 4. When the word “wedding” is attached to something, it becomes a lot more expensive. A candleholder is a candleholder, whether it’s a “wedding candleholder” or not. For a ring bearer pillow, you can buy a small plain white pillow and tie a ribbon around it, and save yourself quite a bit of money. If you really want something that was created specifically for a wedding, at least try to shop clearance. No one will know that your guest book is from last year’s wedding collection. Trust me. 5. Ask around. Your family, your friends, and your friends’ family and friends probably have some of the things you are looking for. My friend’s mom had close to a hundred candleholders from her daughter’s wedding, just sitting in a box. If it’s something that you will use only on your wedding day, it’s worth asking to see if someone you know already owns it and is willing to loan it out. 6. The Internet is your friend. If your friends don’t have it, the Internet does! I found my husband’s Titanium wedding band on Overstock.com for $30 after I typed ‘titanium wedding band’ into Google and found that Overstock was the first website listed. After that, I realized I was onto something, and did the same thing for other necessary items. My cathedral length veil (which can retail $200+ on bridal websites) was also $30, from Etsy.com. There are also websites for those who are selling their wedding goods for a reduced cost. A good one to check out is ‘Recycle Your Wedding’ on Ruffledblog.com. 7. Think outside the box. Instead of hiring a traditional caterer for the reception, which can cost upwards of $20/person, we ordered burritos from a local taco truck for $3/burrito and then bought ingredients for our friends to cook up side dishes. We put chips and salsa on every table, and even after buying thank you gifts for those that helped, our price per person was around $6. Our guests loved it! We also decided to forego an expensive cake in order to do a dessert bar, and had friends contribute their favorite type of cookie or dessert. 8. Trade services. My friend owns her own wedding flower business, and did my flowers at cost, in exchange, I am helping her with some things for her business. It worked well for both of us. Think about what you are good at, and offer your services to those whose services you need. 9. Remember – there are some things that are worth spending money on. No matter what, I will always tell brides to hire a day-of wedding coordinator. You cannot do everything yourself on your wedding day, and your bridal party members are busy too. Our wedding was at 5 in the evening, and our day was completely full. There is no way that I could have met with vendors who were making deliveries or set up décor. My coordinator was a lifesaver! If you absolutely cannot afford to hire someone, a friend might be willing to help. 10. Have Fun. Ok, so this isn’t a way to cut cost, but it’s so important! Whatever you do, figure out how to make sure that all you have to do on your wedding day is have fun. I know of brides who were trying to do DIY projects while getting their hair done…no thank you! By the time the rehearsal dinner started, we had completed everything on my checklist – all we had to do was celebrate! So ask for help ahead of time, ditch projects that are too time consuming, and drink a glass of champagne instead. No one will notice what didn’t get done. Do you have any more pieces of advice to give from planning/attending a wedding? Other peeps who think innovatively about being wise & creative with our resources. Check ’em out HERE and HERE. Love this! We had a very similar budget as well. One thing that really helped me was my family members who offered their services. My aunt made all our bouquets and centerpieces with flowers from the dollar tree (best thing ever!). And my other aunt helped design and print our invitations! Etsy and Google were my best friend (found ties for $7 a piece for the guys). It really is amazing how willing your friends and family are to help with anything you need. If someone offers to help, take it! You’ll be glad you did! I had some friends get married last year on a Thursday at a local winery. Getting married on Thursday; 75% off the normal wedding for Friday/Saturday/Sunday. Friday was a celebration dinner, not a wedding reception; exactly the same menu and offering of a reception, but labeled a ‘Celebration Dinner’… 60% off and about $10 per person. Although your wedding is a wonderful day, it should be the low point or your marriage with your spouse. It is your first day together and as you grow and learn more how to Love and Respect each other your marriage relationship will blossom and grow more and more with every passing day. We still laugh about that conversation, but it has greatly simplified the planning. Decorations will be cute but minimal and I’ll delegate them to friends who are better at it than I am. We’re having an afternoon wedding because more people will be able to make it a day trip. Also, a cake reception lets us include more people than a dinner. We are going to have a light lunch of party subs and chips and fruit with our family and wedding party between photos and the ceremony, though. We made our guest list in MS Excel so we can do a mail merge to print address labels with minimal effort. The invitations do not require any folding or assembling, so we will just stick them in envelopes. We’re having the music we want, the cake flavors we want, iced tea and Italian soda (because we don’t like punch). 1) Have your rehearsal at least two nights before the wedding. To be honest I don’t know how the rehearsal dinner fits into things (I’m an Aussie, and it’s not so common) but the most stressed-out rehearsals I’ve seen were always the ones done the night before. 2) Organise a few people to help pack things up. Help setting things up is a no-brainer, but oftentimes as a guest I’ll pop back into the church to help the person (often a church staff member who knows the couple) trying to set things back to normal for worship services. Many hands make light work on this one, and allow everyone to get on with the party quickly. 3) Ask your pastor/minister for advice. Hopefully the person you’ve chosen to marry you is someone who knows you both well and will be able to make good suggestions customised to you. And unless the person is fresh out of seminary, they’ve probably been to and conducted quite a few weddings. Use that knowledge and wisdom, including for good ways to decorate the church you’re getting married in. For example my church has a few beautiful items used especially for weddings that many people wouldn’t know about.